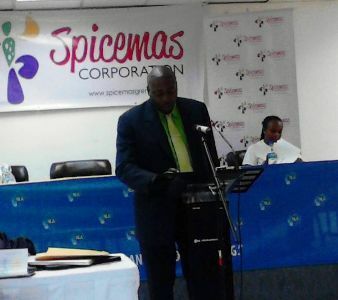 Chairman of the Spicemas Corporation (SMC), Alister Bain has confirmed that the Spicemas 2014 theme will be modified due to concerns coming from the public that the theme might not be a true reflection of Grenada’s status with regards to the development of calypso and soca in the region. The theme was announced at the launch of Spicemas 2014 last Tuesday. The chairman said that though the wording of the theme may change, the essence will remain the same. “The idea is to put our Grenadian calypso and soca artistes in the spotlight, let the world know who they are and the contribution they are making towards the art form. Carnival is our peak celebration for the artistes, and this theme was just aimed at focusing on them as we celebrate calypso and soca in 2014,” he said. The theme announced during Tuesday launch was “Spicemas, the Mecca of calypso and soca.” Bain said that the new theme will be announced in an upcoming event of the SMC. Carnival is expected to be officially launched on 31 May. The venue for all major shows will be the Roy St John Playing field in Tanteen, as there will be cricket events in the National Stadium. Bain said that this year, the SMC Board decided to reintroduce the Queen Show and the Pageant as major activities during carnival week. Spicemas 2014 will conclude on the second Tuesday in August.